And a Happy Birthday to my stepfather Hartley, a lovely man. I phoned Hartley this morning and he did not see his shadow. Hazzah, hazzah! Spring is coming. Which I pretty much figured seeing as I have 59 irises coming up. That’s right 59. I don’t know why I counted them but I am a bit worried about them so Hazzah! again for not seeing a shadow. I didn’t count the tulips and daffodils though, they can take care of themselves. Oddly enough, I haven’t heard a peep out of the crocuses. I made Hartley this card. I was out having a chat with the local groundhog, Jack Fickle McRumplestein, when I mentioned that Hartley was born on Groundhog Day. Jack insisted on posing for me. I think he may be under the impression that Hartley is part groundhog and all the better for it. I should have taken this photo before I varnished it. Ahh well. I also did a few more miniatures. Except for the leopard, these all have new homes. As always these will appear larger than they actually are. This is an acrylic of a path near my house. It’s 2.5 by 3.5 inches (ATC/ACEO size) I used a pointillism technique which is quite fun to do on something that is the size of a playing card. 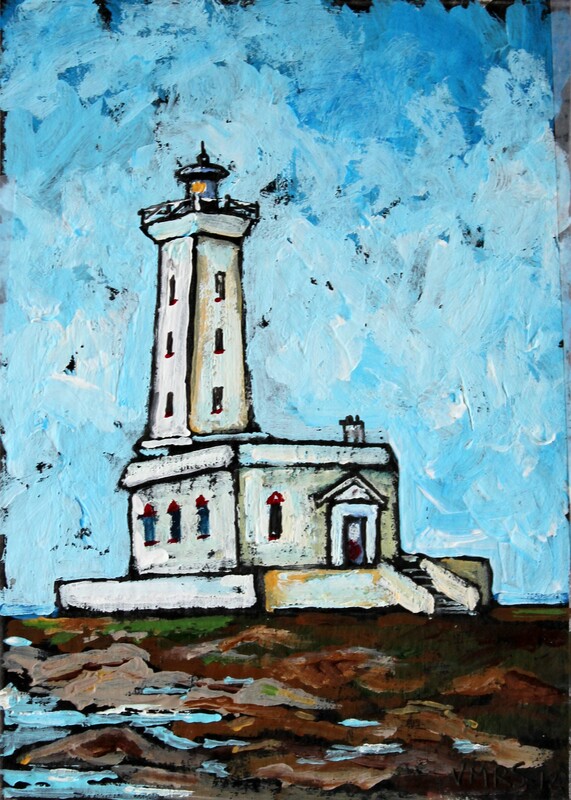 This is the Point Abino Lighthouse which I grew up near. It was operational until 1989 and then fell into disrepair. It’s being worked on now and has been declared an Historic building with a capitol “H”. It’s the only one of that style. I used to love hearing the foghorn at night. Nothing makes you feel more secure than knowing someone is up in the middle of the night keeping an eye out. Especially as I thought that there was Loch Ness monster lurking in the bay and we lived far too close to the lake for me to be happy about it. I was trying for a more painterly simple style with this one. My perspective is bit off but that’s ok, I like the effect. Acrylic 2.5 by 3.5 inches. 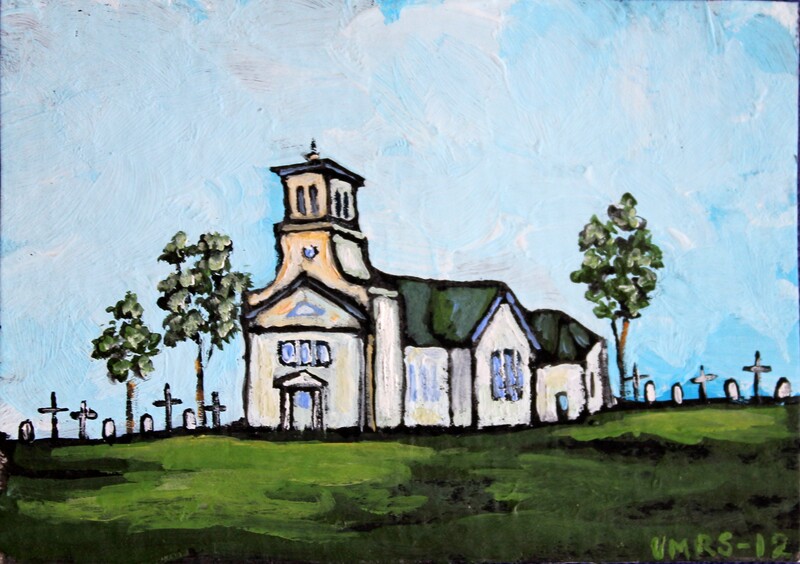 This is a church in Prince Edward Island that my sisters and I came across while rambling through the Maritimes. Acrylic, 2.5 by 3.5 inches. I threw perspective right into the wind on this one too. That’s right I got down and crazy on the perspective. Rebel with a paintbrush, that’s me. Needless to say, he is no longer director of the zoo. And the zoo needs to get a black bear. Here is a photo of the bear that is now gone but who was a sweetie and comical. I’m sorry he’s gone. The moral of the story is to never underestimate the silliness and ego of a person who dresses up like Indian Jones, complete with hat. While I’m on the topic of zoos, here is another miniature, this one is a bit bigger being 3 x 5 inches and is acrylic. 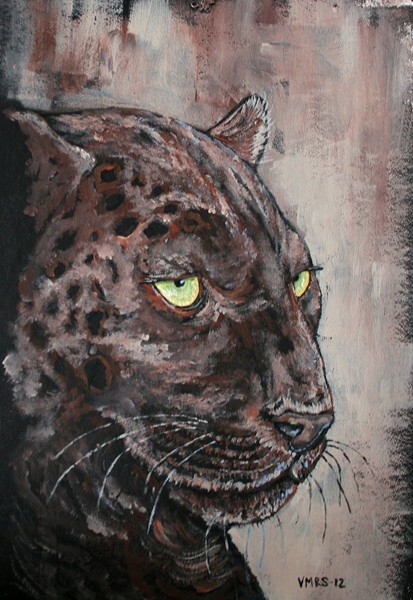 This one is based on a photo of the black leopard that is somewhere back in the blog. Now I have to go find Dummy, he’s been a bit sulky since the tape from his Santa hat is stuck all over his head. He does hold a grudge. I think a nice photo shoot will cheer him up, he’s a vain little Dummy. As to the Point Abino Lighthouse, there is a group that worked to thwart the town from matching a grant to restore the light house because they don’t want to fix up a place with limited access. The battle got really ugly around here, but the work is now almost done and the beautiful historic landmark will glisten once more. Thank goodness, I love that place, I just wish it had public access. The politics of Fort Erie have become very ugly! You’re a brave woman to try and keep on top of that mess! Wow, Virginia! Beautiful pictures! I just love the one for Hartley. Thanks, I don’t think he received it yet, I don’t know what’s going on with the mail but it’s taking weeks for stuff to get to Mom’s from here. Ridiculous. I love all these tiny paintings! Thanks for sharing! Thanks for sharing all the paintings, they are really great. I am sorry to hear about the Zoo troubles, I hope that they can think of some way to use the donation. Pandas are amazing, I recently visited the San Diego Zoo and wanted to give the Panda a great big hug. I don’t think they like hugs, but he was adorable. Thanks. Pandas are so cute! I just love them. They’re so expensive though. Fortunately the executors of the Will have said it’s fine for the zoo to use the money for a new bear habitat. I love the paintings. 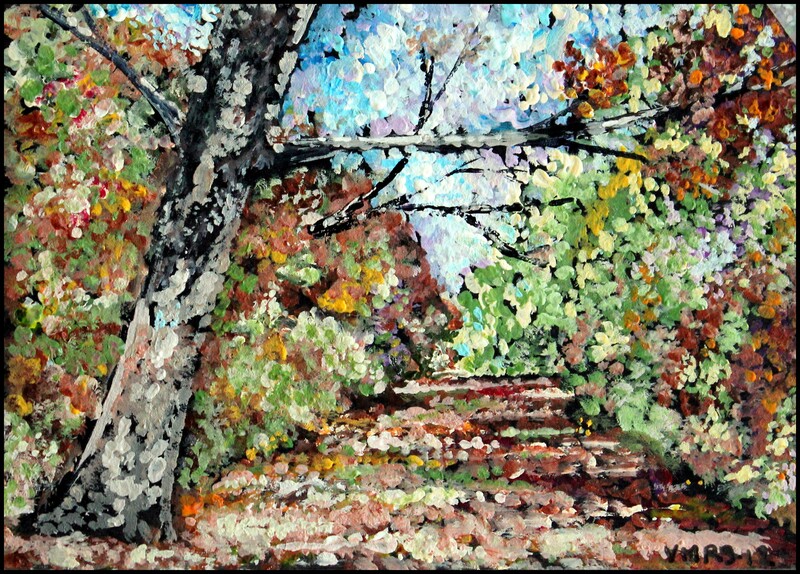 The colors, subjects and spontaneity in the acrylic of a path made me long for the winter to end. Thank you. We’ve had an oddly warm winter, so much so that my primroses are blooming and my lilacs have buds on them! They don’t normally do that here until the end of April. I love your paintings, particularly the pointillism one. Also, the lighthouse and the church. Very nice. 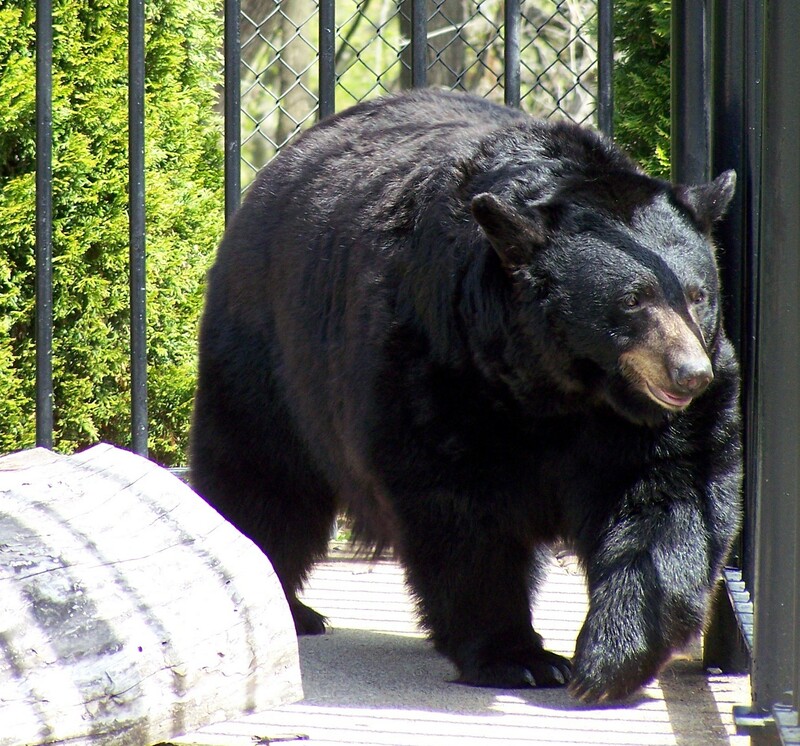 Sorry about the zoo mess – the black bear you photographed looked like one fine bear. Thanks, that bear was very comical and quite social. At least the next bear will have a nice enclosure though. Great paintings. I especially like the first one. I wish I had your talent. Thanks! It’s mostly just patience! Loving your website by the way, great idea. I love your pointillism landscape! And your architecture is the best. Happy Birthday to your stepfather. 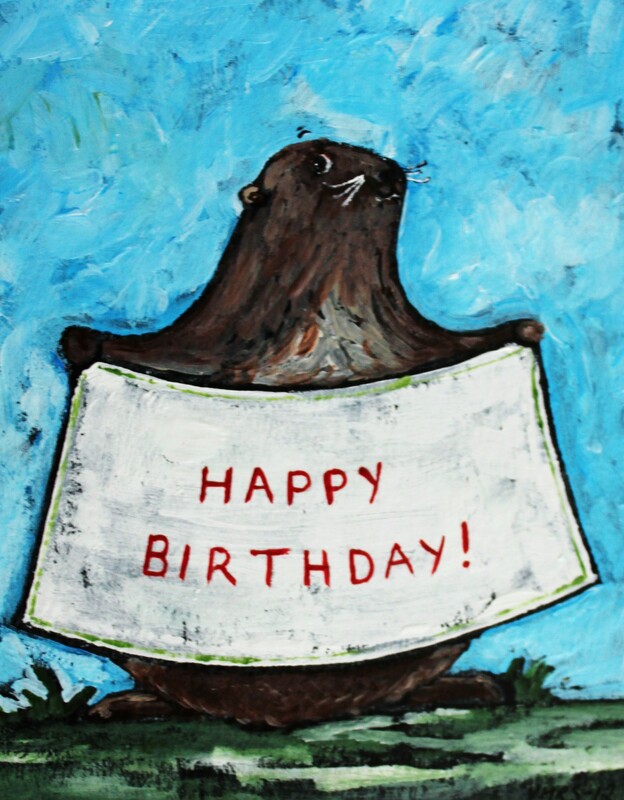 Anyone getting a birthday message from a groundhog must be very special.